Quality over quantity, this compilation released by Touch and Go Records in the mid-'90s is a who's who of the times. 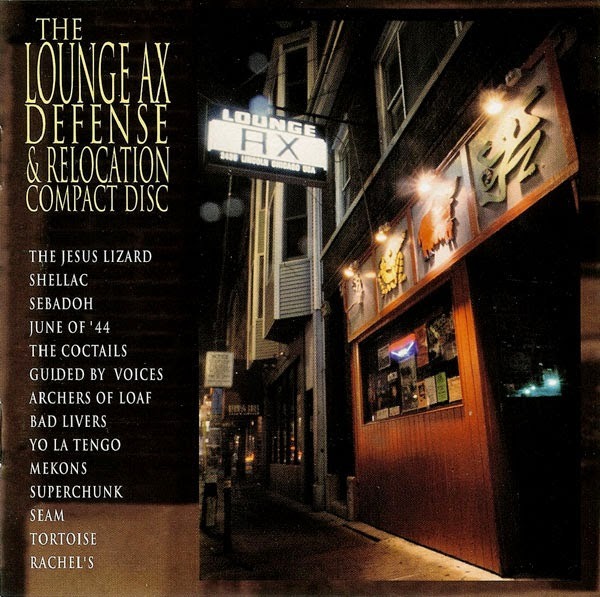 It's not every day a compilation really delivers, but The Lounge Ax Defense and Relocation Compact Disc (full title, by the way), is a place and time collection full of unreleased material. Touch and Go released this, uh, in defense of the famed (now defunct) club Lounge Ax in Chicago. Facing mounting fines due to archaic zoning laws, and neighborhood harassment, the club was in danger of closing its doors. For a full recap, the history of the club's legal troubles are documented in the liner notes. 14 bands answered the call for Touch and Go and Lounge Ax, and the collection is well worth the price of admission. Featuring tracks from Jesus Lizard, Shellac, June of 44, Sebadoh, Archers of Loaf, Superchunk, Yo La Tengo, and Tortoise, the comp. also boasts an exclusive GBV tune. To date, this remains the only spot to obtain the track. Grab this comp. Beneath a Festering Moon- 5 Another sign of the times, this exclusive cut perfectly captures the GBV in '96. At the height of their powers, Pollard croons this hazy, strung out, haunting ballad. Acoustic opening gives way to full band trudge, into instrumental extended outro. Wonderfully executed. nostalgic from the first note without being cloy.